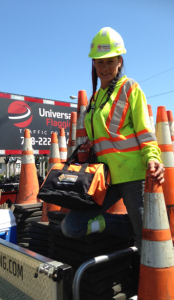 Congratulations to Joanne Collerette of Universal Flagging, who recently won a vehicle safety kit with one year of roadside assistance at the Cone Zone Go-Kart circuit at the Cloverdale Rodeo. Joanne really enjoyed volunteering at the event, teaching the next generation of drivers about road safety and the importance of paying attention when travelling through roadside work zones. Having worked as a Traffic Control Person (TCP) for many years, Joanne knows first-hand the dangers of working in Cone Zones. She believes that being a mother of four helped train her to be a safer TCP because just like moms, roadside workers need to be acutely aware of their surroundings at all times. Joanne is hopeful that more British Columbians will slow down and pay attention around roadside work zones as a result of the Cone Zone campaign.